If you are looking for a warm casual winter coat for those long walks, how about this Bubble Hem Parka from Top Shop? 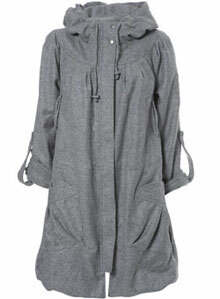 In light grey, it’s not quite the traditional fish tail parka, but rather one with a modern twist. It is three quarter length and has a draw string hem and waist, with lots of pockets for your gloves, change and bits and bobs. 60% wool and 40% polyester, it is also machine washable which makes it practical for everyday wear. For £60 it doesn’t seem like a bad buy. Find out more on the Top Shop website.